"The Motorized Patriot is a testament to the technical prowess and power of Columbia." Originally constructed by Fink Mfg. to serve as a tour guide for the residents of Columbia, the Motorized Patriots now serve as a standing guard for the entire city. Fearless and unrelenting without a shred of self-preservation, the Patriots will track down and eliminate any opposition without remorse. Will you be able to find the right combination to defeat these automated monstrosities? One of the complaints about the original BioShock was that there was a lack of villain diversity. Yes, the Splicers all had (slightly) different abilities, but you had hordes of them, and then the Big Daddies; that was it. BioShock Infinite mixes things up a bit, adding a class of "Heavy Hitters" in the middle ground. The Motorized Patriot is, as the bio suggests, sort of a grim version of the audio-animatronics in Disney's Hall of Presidents. His face looks like cracked porcelain, like an old doll. Or I suppose rubber, since it needs to move and flex as he talks. He's still super creepy, with his one missing eye and his "dull surprise" mouth. Once upon a time, the Motorized Patriot was dressed like George Washington. You know, blue wool coat, buff pants and waistcoat, yellow epaulets, etc. That's what Washington wore, so that's what the Patriot wears - at least, he wears the tattered remnants of it. Remember, these guys were only repurposed as war machines, they weren't meant to take a lot of heavy wear; so it's no surprise that after a few battles, his clothes are getting torn to shreds. There are scorch marks and bullet holes, and the cloth around his knees and right elbow is torn away. 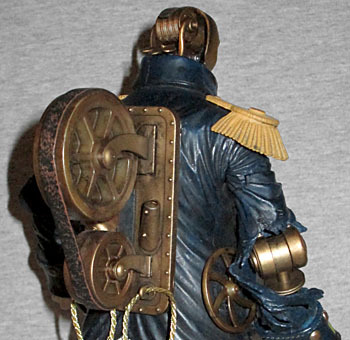 Since the Motorized Patriot is basically just a steampunk Terminator, his visible internal workings appear to be big brass hinges. He has flywheels on his hips, and a large pair of belt-driven gears on his back (his conspicuous in-game weak spot). The right sleeve and pantleg are made from a softer PVC, so they can flex around the joints - not, it must be said, that the joints actually move very well. But we'll get to that anon. Heck, we might as well get to it now. MP is a big figure, breaking the 8¾" mark, so he needs sturdy joints to support him; we can accept that. But the hinges in his knees and elbow are so stiff, it feels like the post that extends from them (forming the shins and forearm, respectively) is in danger of breaking off. I got mine moving, but it was a very dicey process. Beyond those, he has a balljointed head and neck, swivel/hinge shoulders, a swivel in the right bicep, a swivel/hinge left elbow, balljointed wrists, what feels like a balljointed torso (though the jacket makes it hard to move), balljointed hips, and balljointed ankles. So while it sounds like a lot of joints when it's all listed out like that, the range of motion on most of them isn't very good, meaning his poses are limited. Of course, the character in the game just clomps around trying to shoot you, so we're not going to be too upset if the toy can't do anything besides that. He wouldn't be able to shoot anything if he didn't have a gun. The Patriot's weapon of choice is the "Peppermill" Gatling gun, a hand-cranked weapon - since the technology that animates the Patriots isn't good enough to allow moveable trigger fingers, but means they can spin the crank like a dervish. It's an impressive piece, painted like steel and brass and given dark weathering to suggest its age. There's a hinged flap on the side with the ammo box, but the best feature is that the gun actually works. 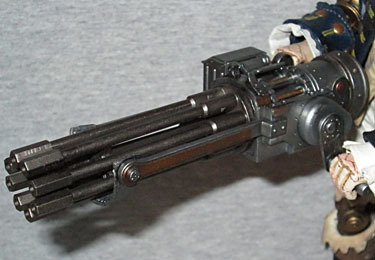 It doesn't fire, obviously, but the crank turns freely and it makes the barrels of the gun spin. That means NECA had to fabricate an entire series of gears, and have the factory assemble them inside the gun in perfect working order, and they did. The gun has eight barrels, and a full turn of the crank advances the entire assembly by three barrels, so in order to achieve the maximum 1,500 rounds per minute, the crank would have to turn 500 times - more than eight revolutions per second. The toy's hands are just a little too small for the handles on the gun, and you run the risk of breaking them off as you take them in or out of the hands. So before setting him up, we recommend taking an X-acto and cutting the thumb apart from the fingers; it adds just enough "flex" to the grip to make the hands wide enough to grip the gun, without making them so loose that he'll drop it. 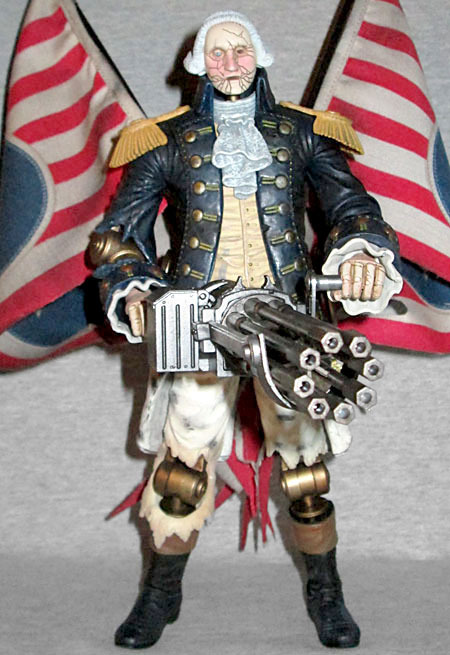 As you blast away at the Motorized Patriot, his rubber mask gets destroyed, revealing the "skull" beneath, and the toy includes a second head to show that. The majority of the face is a metal bowl, while the jaw and nose are wooden. A series of holes are arranged in a circle on the forehead, presumably to act as a speaker for the robot's pre-recorded lines. 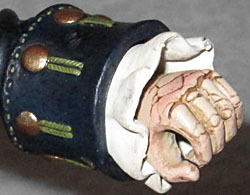 His "brain" is a grooved drum held between two arms, like the cylinder in a music box. There are three large tabs below that, reminiscent of the pedals on a piano - maybe they switch him between different pre-set spiels? The head is mounted on a long post, and can be swapped out via a large balljoint. Getting them in and out is no easy task - like the hinges, I was afraid something was going to break. We're still not done with the accessories! Columbia has its own flag - 13 red and white stripes, and a large blue badge with a white star in the center - and the Motorized Patriot has two of them sticking out of his back. Fitting with the fetishization of George Washington, they make him look like he has two American flag angel wings (somewhere, a Fox News contributor just got an erection). The flags are tastefully tattered, with purposefully cut holes and shredded ends, as well as some darkening from soot. So that the flags don't flap around behind him all day, there are two gold cords looped behind his waist - the excess material gets tucked in there. 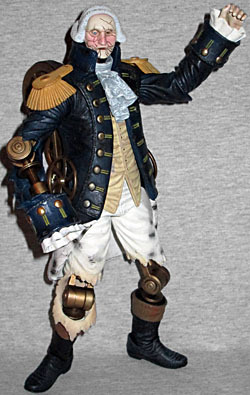 The Motorized Patriot is the biggest Bioshock Infinite figure we're getting from NECA - they started a Handyman prototype, but he was just too big and too expensive to move forward. But the Patriot only costs about $30 (retail), which isn't too bad for what you get. The toy is huge, the accessories are awesome, and even though the articulation is problematic, he does enough to match the game. 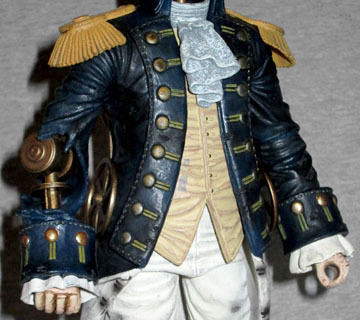 Plus, who wouldn't want a giant steampunk George Washington Terminator?